It’s October. 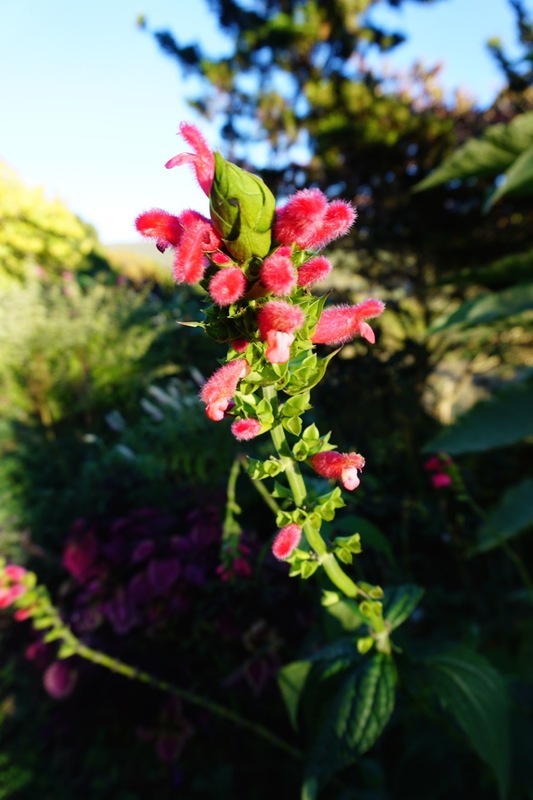 Fall is such an underrated time in the garden, and much pink can be found. In fact, flashes of pink are everywhere!! Got my ma’ams grammed last week; thanks for the reminder, NFL. Aye yi yi. Alleged hybrid between M. capillaris and M. lindheimeri. 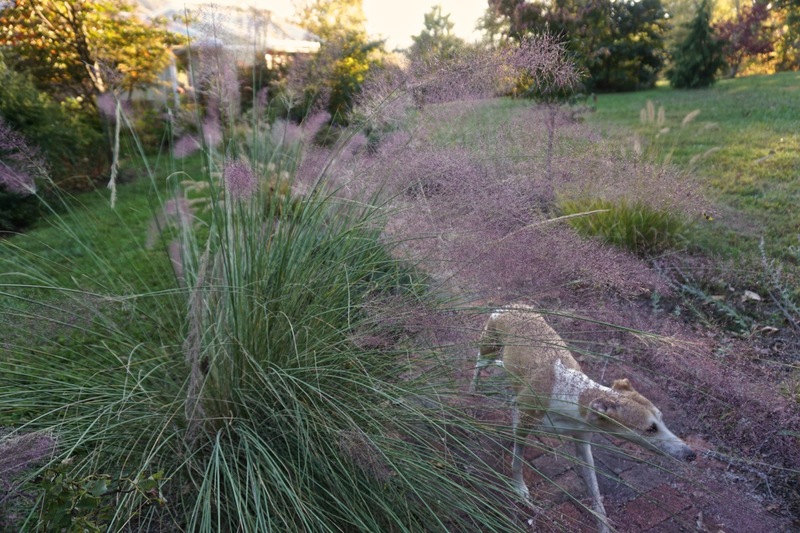 Five feet tall and as wide, huge plumes of pink. Looks like nothing important the rest of the year, then, blammo!!! Sorry, folks north of Zone 6. Actually, it only works here (Z. 6a) because of outstanding drainage; it’s planted in a pile of gravel. Mine has lived through two winters with -20 F days. Place where the sun will rise or set behind it for maximum effect. Bunny the Whippet not included. Big ol’ gal that will not favor you with blossoms until September. Absolutely not hardy here, or anywhere north of Zone 8. Take cuttings, ’cause baby she’s worth it. The furry, hot pink flowers will thrill any hummingbirds left zipping around (I read ours the riot act this weekend, they have GOT to hit the road soon). Note there is some hullabaloo as to S. puberula vs. S. involucrata vs. some hybrid amongst the two. Will report back. Chrysanthemum x whatever ‘Venus’ . Am so tired of the taxonomic uncertainty. 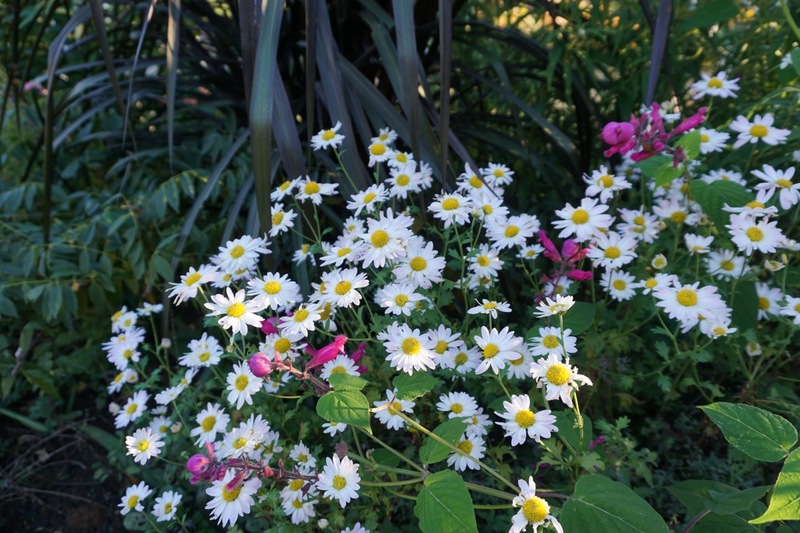 Chrysanthemum…Dendranthemum… Whatever you call her, ‘Venus’ is a wonderful “real” garden mum (not those heinous meatball things) that brings the pink blooms in September, then fades to palest of pink, but not before every bee in the neighborhood visits. Fairly compact (2-3’) and pretty darn hardy (Zone 5). Tuck Venus amongst things you know will be done before fall – bee balm, phlox, etc. to keep the show going! So there you have it, some pink for our October gardens. In loving memory of my sister Carlene.